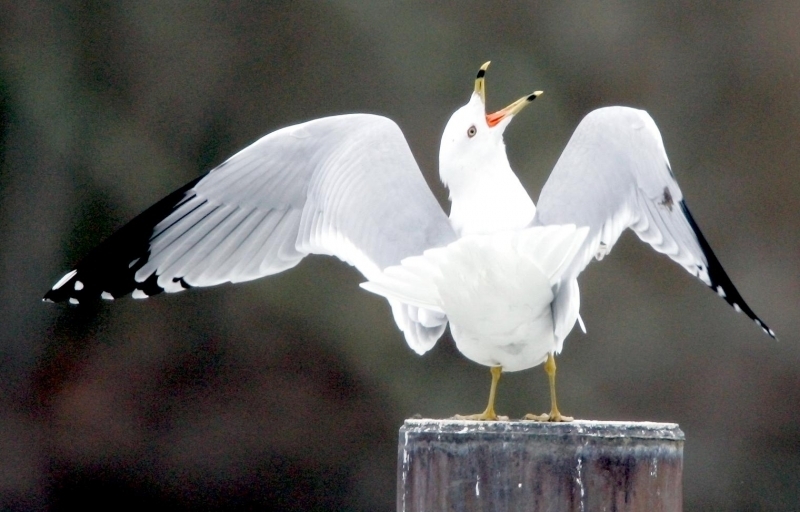 Familiar acrobats of the air, Ring-billed Gulls nimbly pluck tossed tidbits from on high. 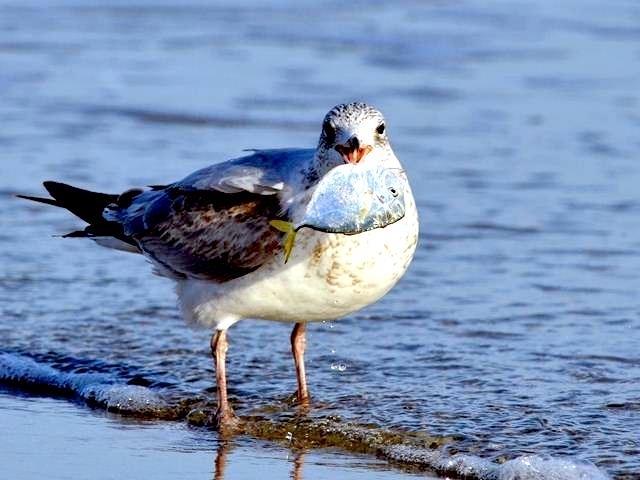 Comfortable around humans, they frequent parking lots, garbage dumps, beaches and fields sometimes by the hundreds. 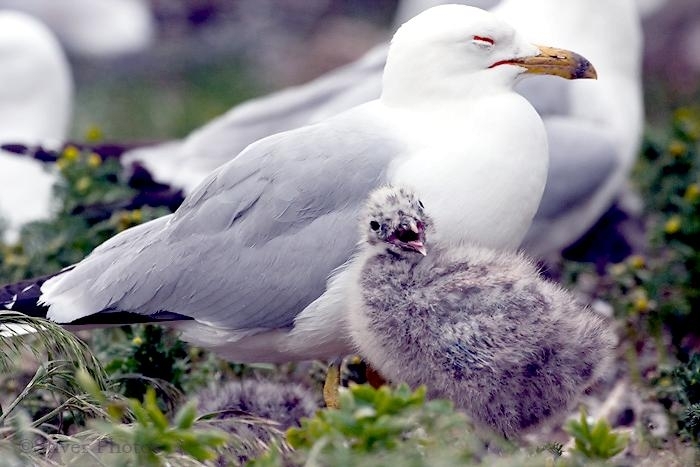 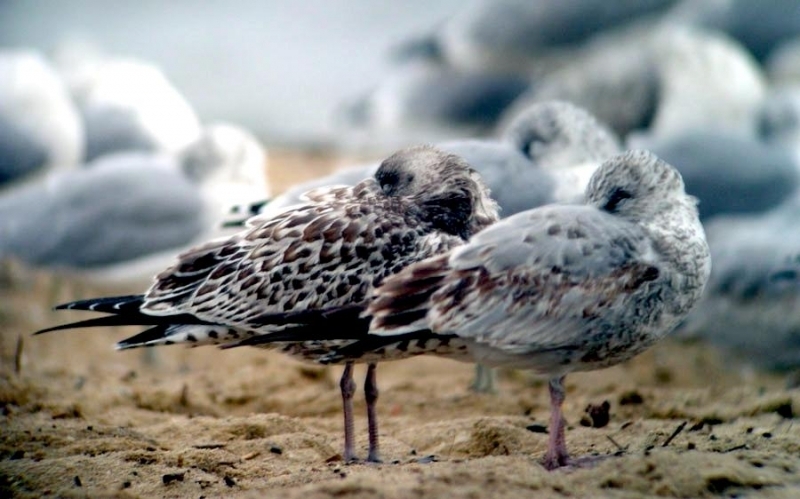 These are the gulls you’re most likely to see far away from coastal areas—in fact, most Ring-billed Gulls nest in the interior of the continent, near freshwater. 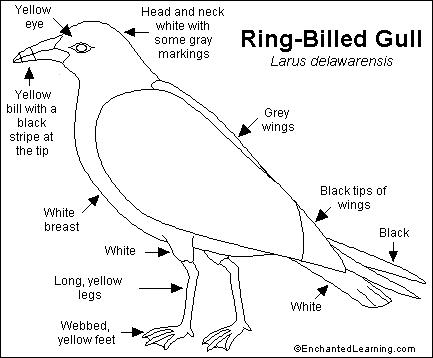 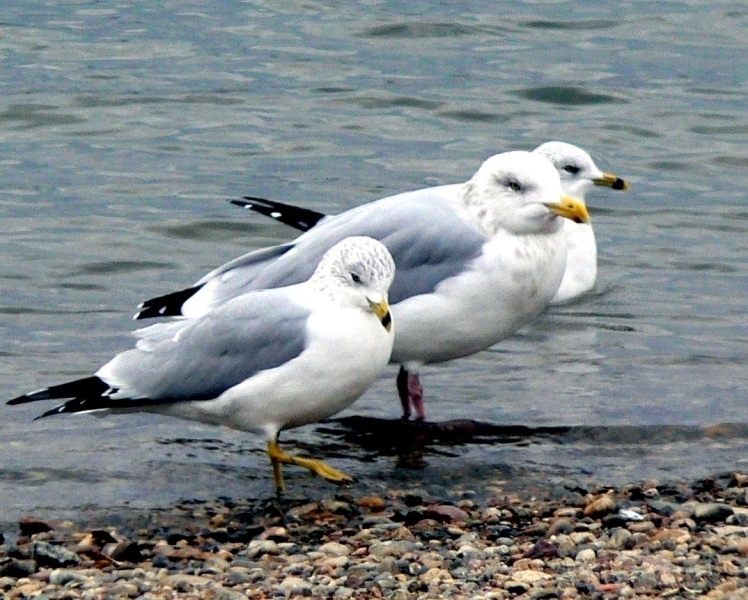 A black band encircling the yellow bill helps distinguish adults from other gulls—but look closely, as some other species have black or red spots on the bill. 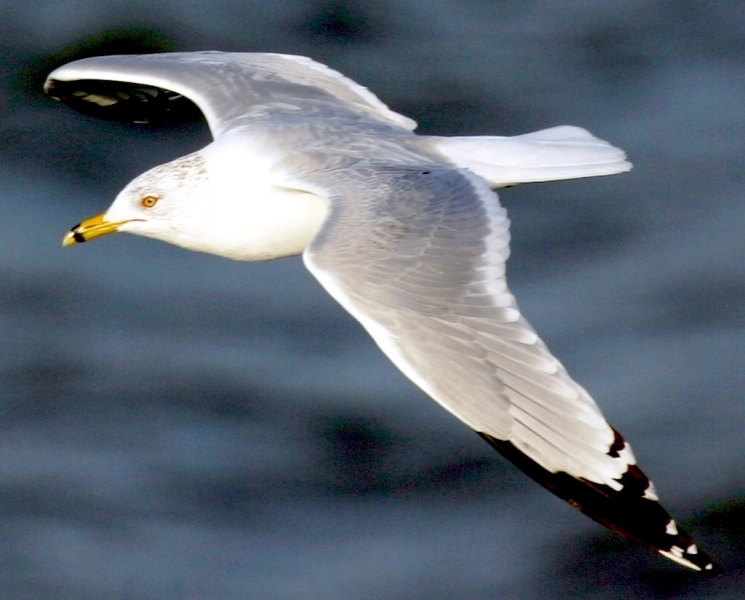 The Ring-billed Gull is a medium-sized, white-headed gull with a short bill that has a broad, black ring around it. 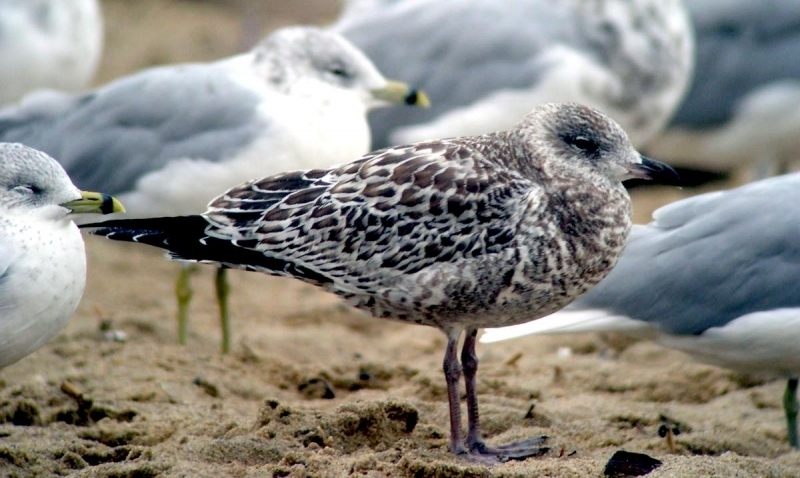 The juvenile is mottled brown mixed with adult plumage characteristics. 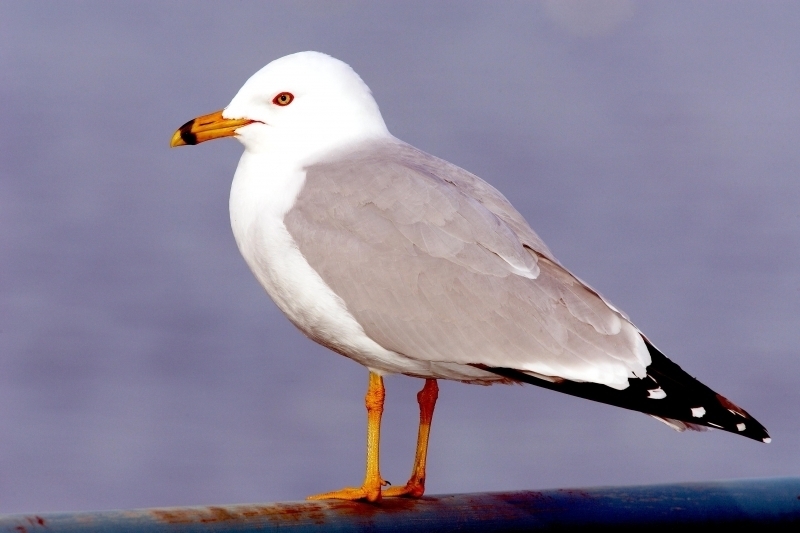 It has pink legs and a pink bill with a dark tip. 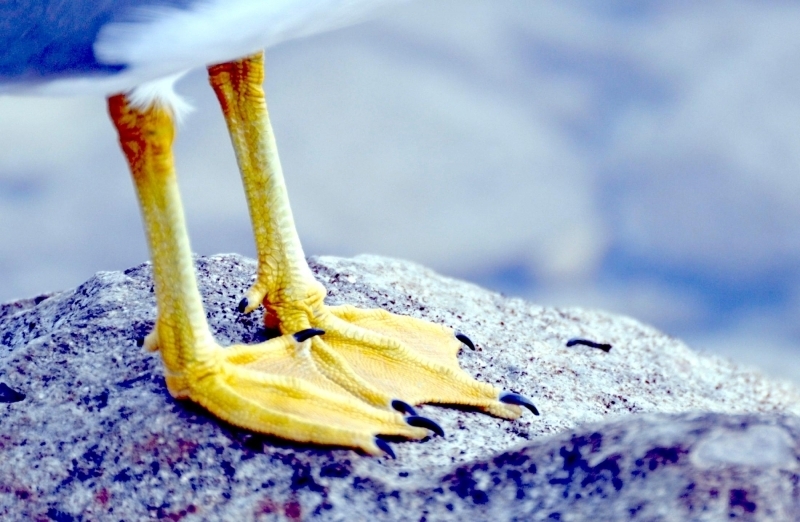 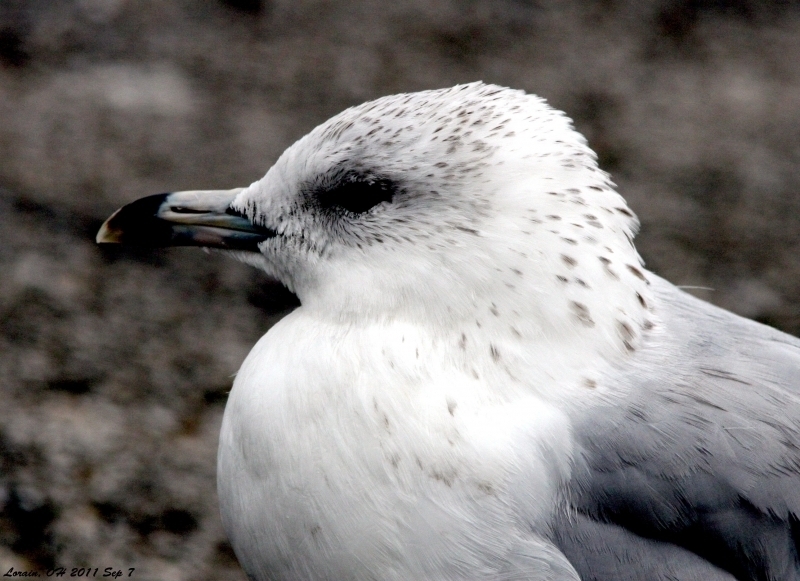 As the seabird matures, the legs turn yellow and the bill becomes yellow with a black ring. 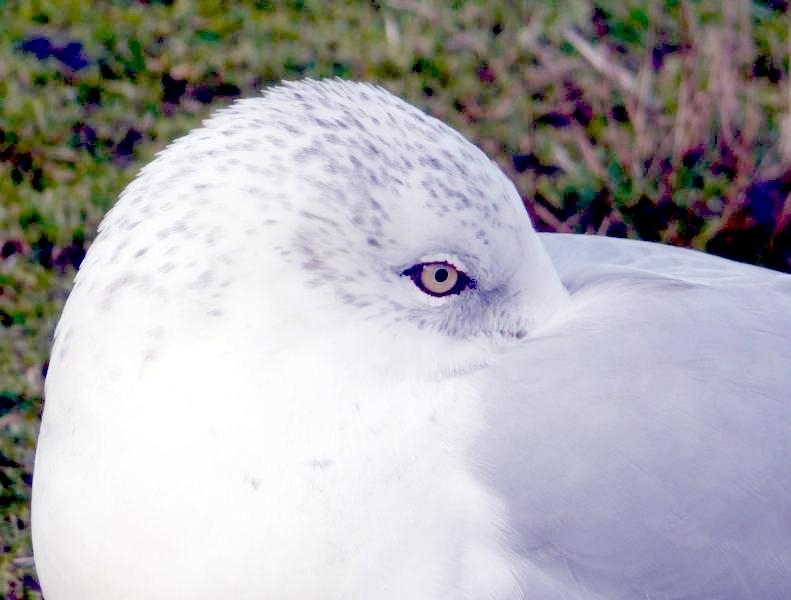 The adult’s eye is also yellow. 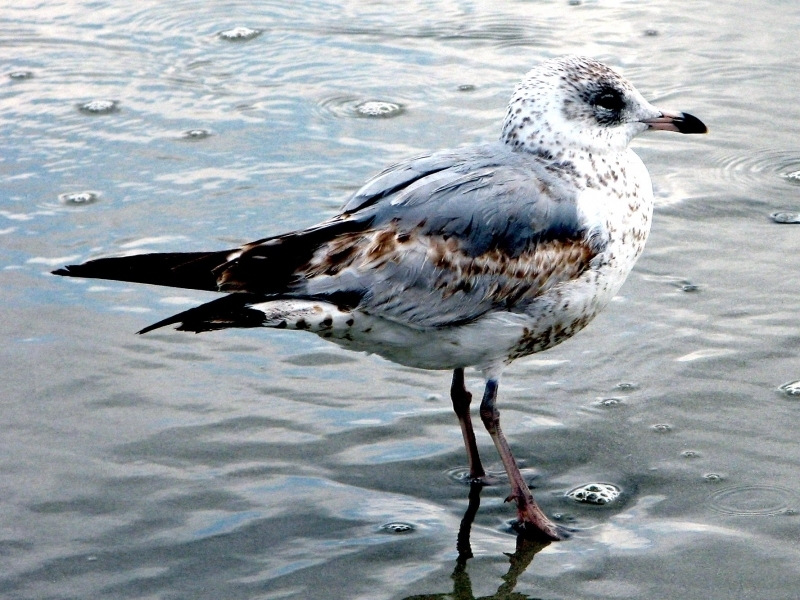 The adult in non-breeding plumage has brown streaking on its head. 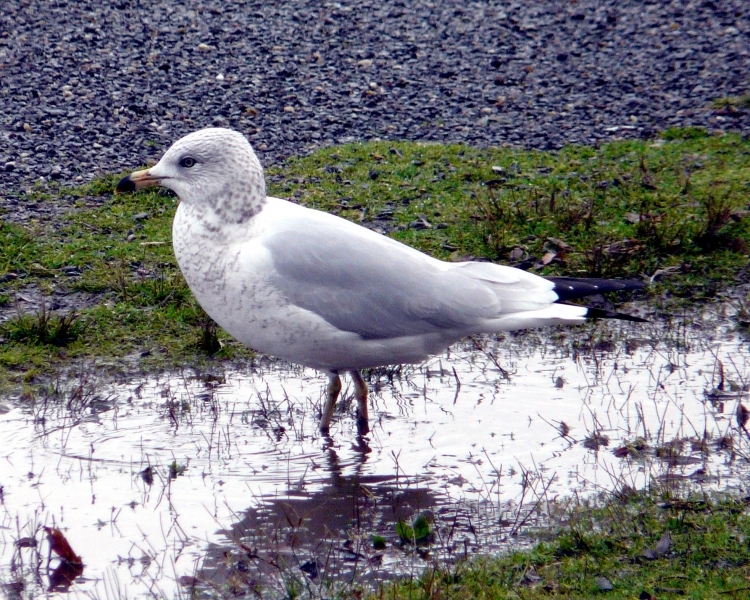 This species is common in eastern Washington, breeding colonially on gravel islands in lakes and rivers and feeding in agricultural lands, cities and wetlands nearby. 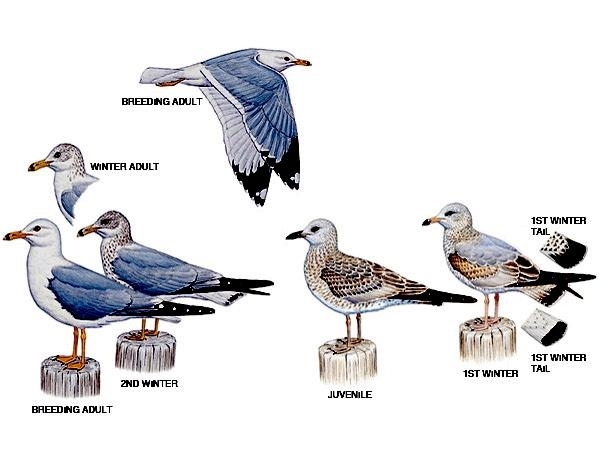 They are locally common breeders in western Washington on dredge-spoil islands in Grays Harbor and Willapa Bay. 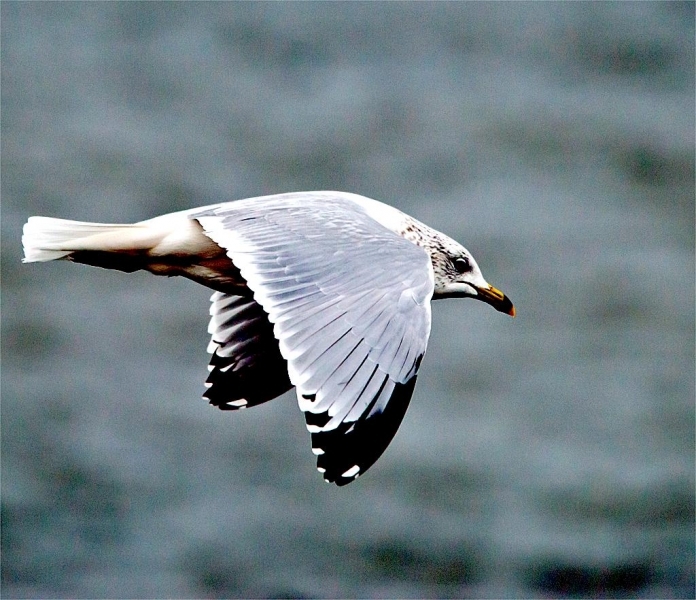 In North America, the Ring-billed Gull breeds in the Northwest from the prairies of Canada south to California. 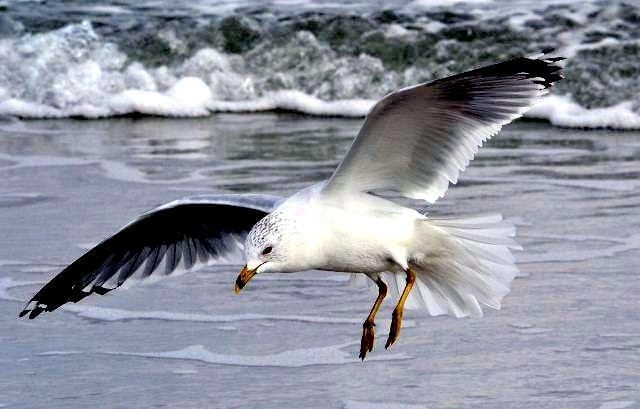 It is also found in the Great Lakes region, the Canadian Maritimes and northern New England. 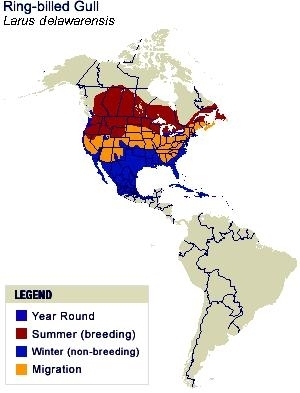 It winters from southern New England south to Cuba, from the Great Lakes south to the Gulf of Mexico and from British Columbia south to Mexico. 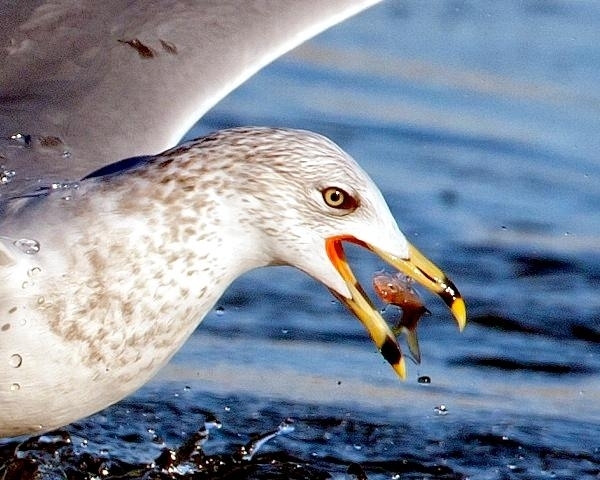 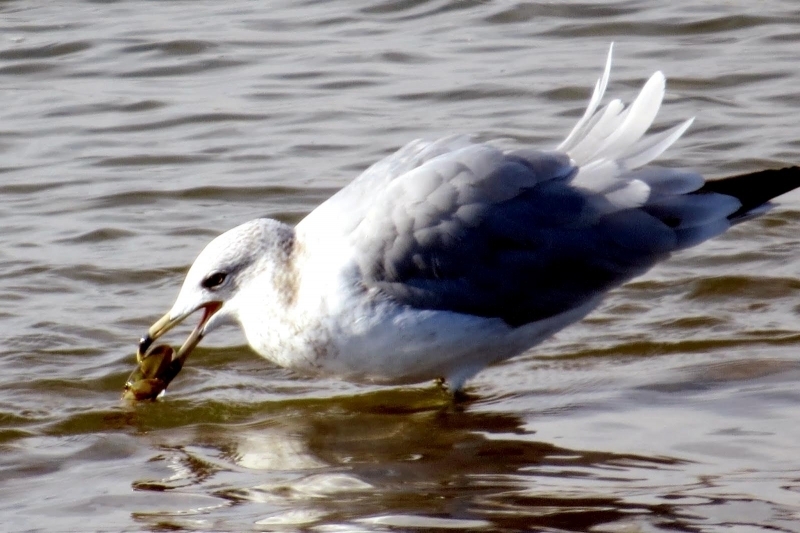 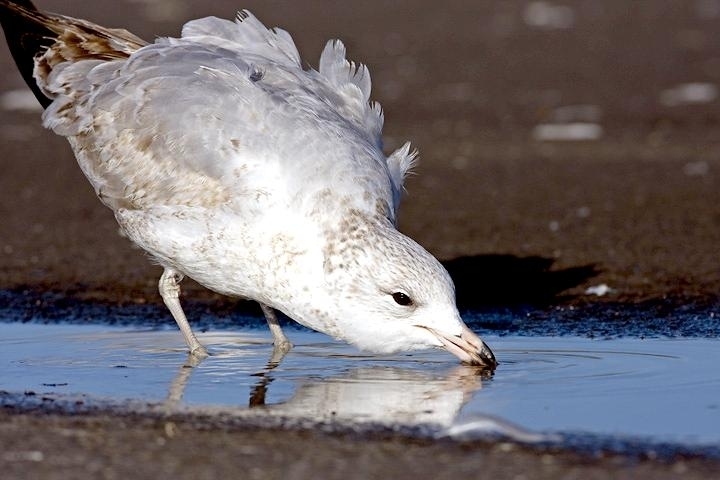 The Ring-billed Gulls eats insects, seeds, grain, fish and garbage. 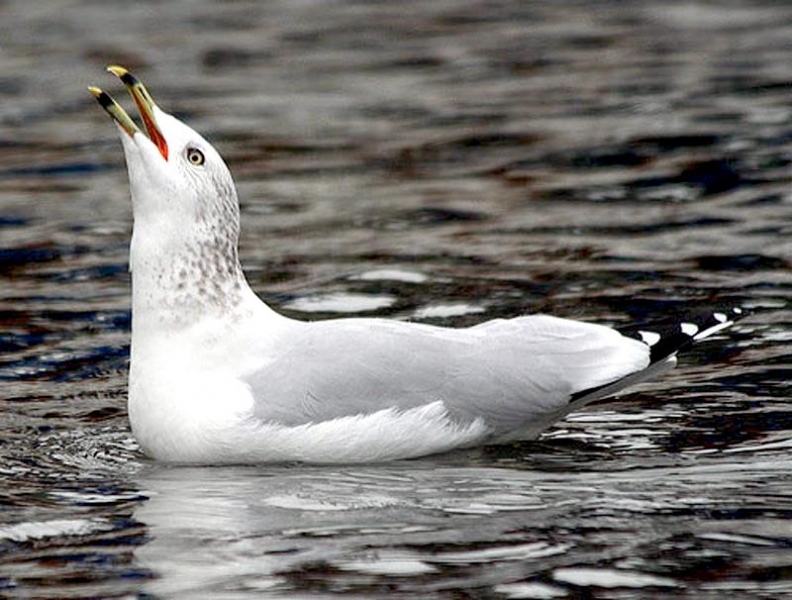 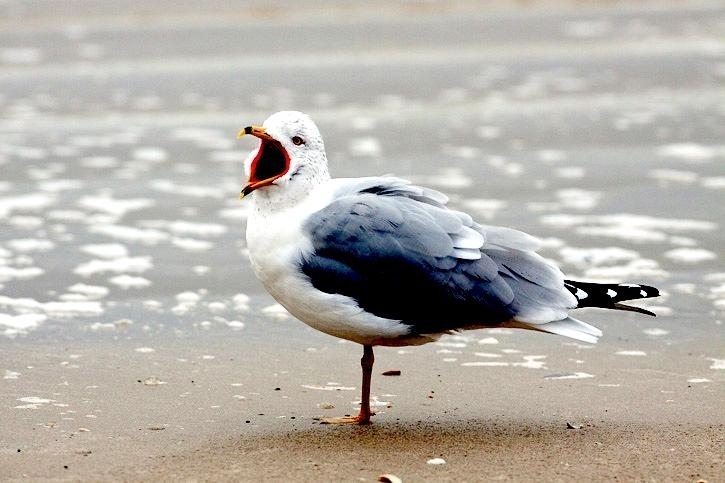 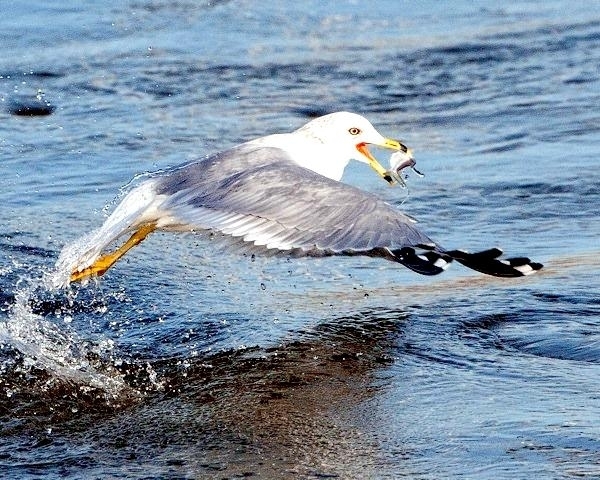 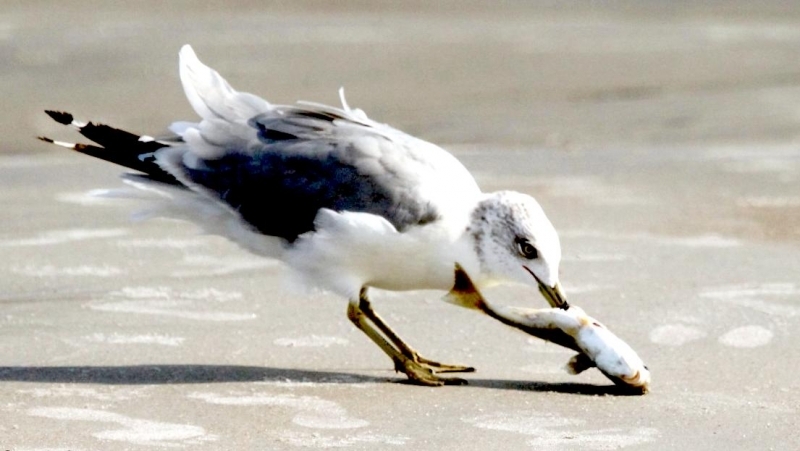 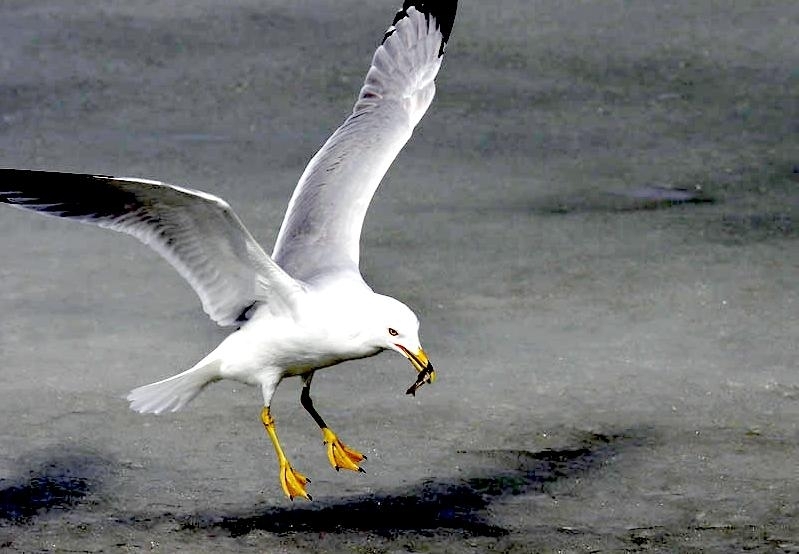 It is often called the “fast food gull” because it often hangs around fast food restaurants scavenging for food. 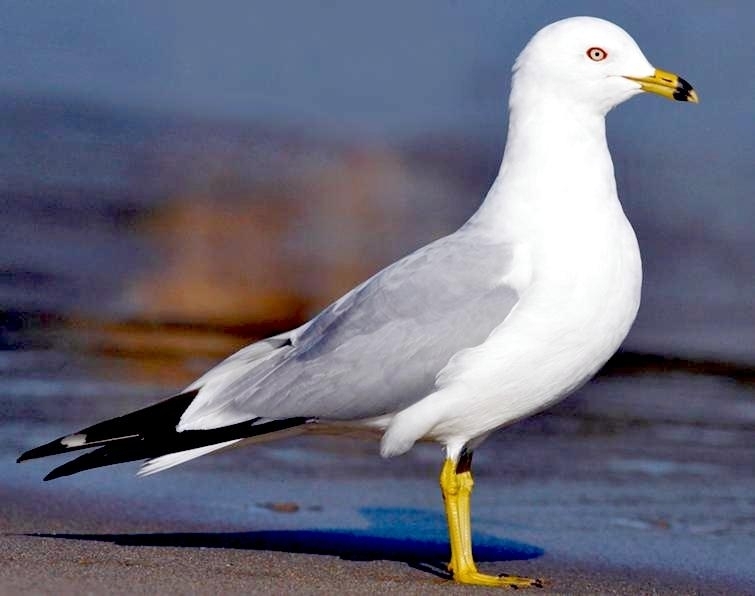 The female Ring-billed Gull lays 2 to 4 eggs in a hollow in the ground. 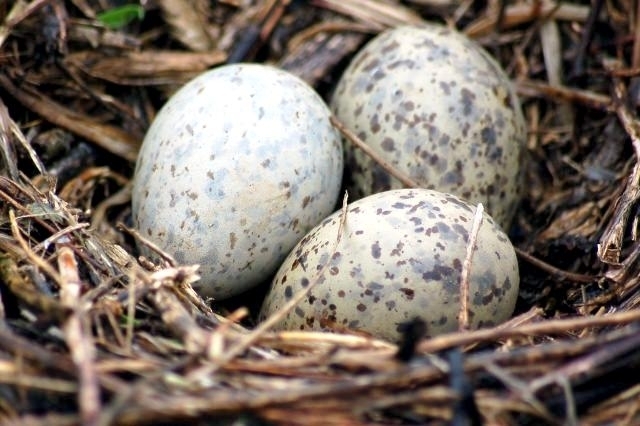 The nest is made with reeds & rushes. 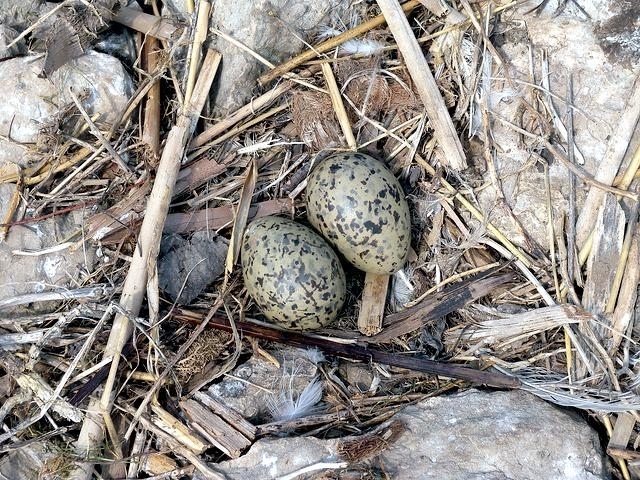 Both the male and the female incubate the eggs. 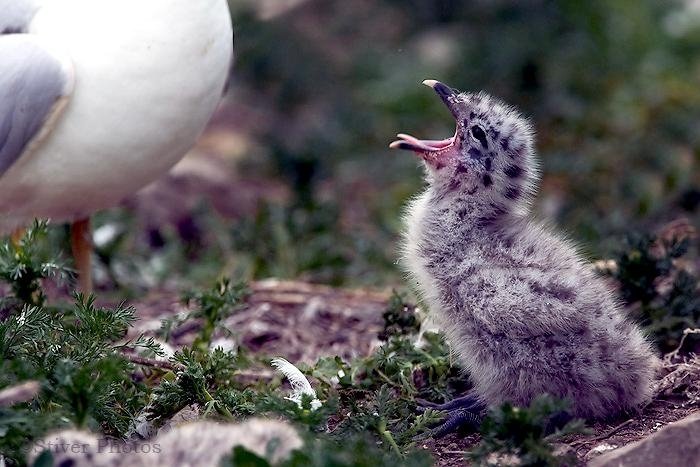 The eggs hatch in about 3.5 weeks. 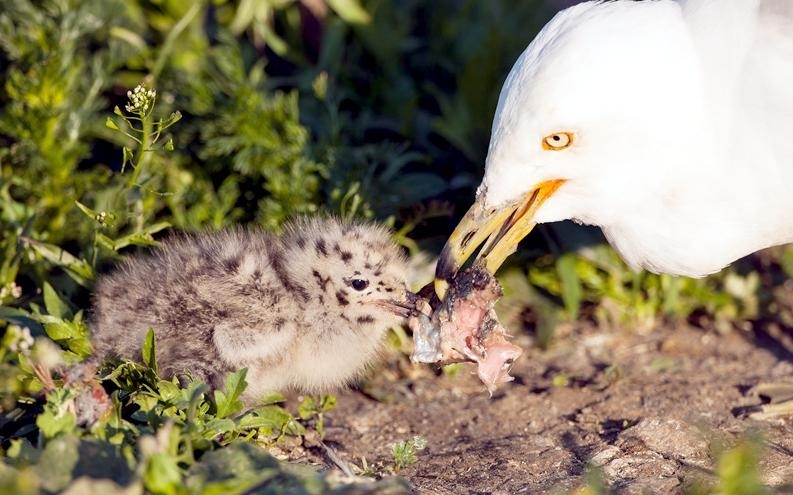 Both parents will feed the chicks regurgitated food. 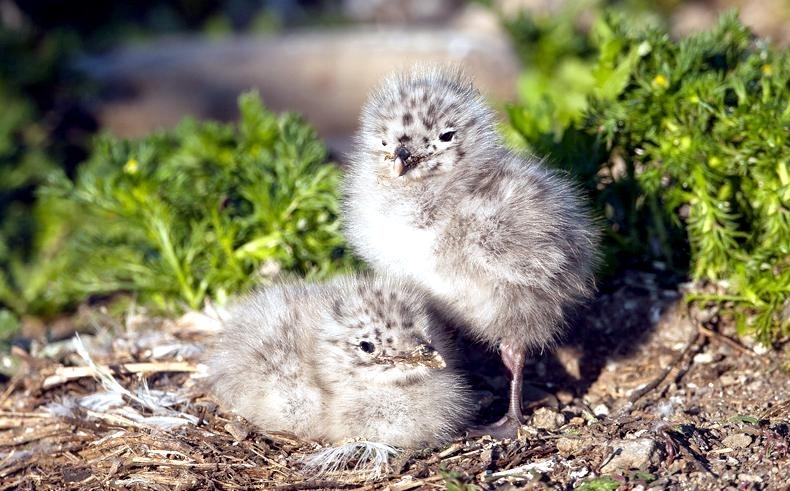 The chicks leave the nest a few days after they are born. 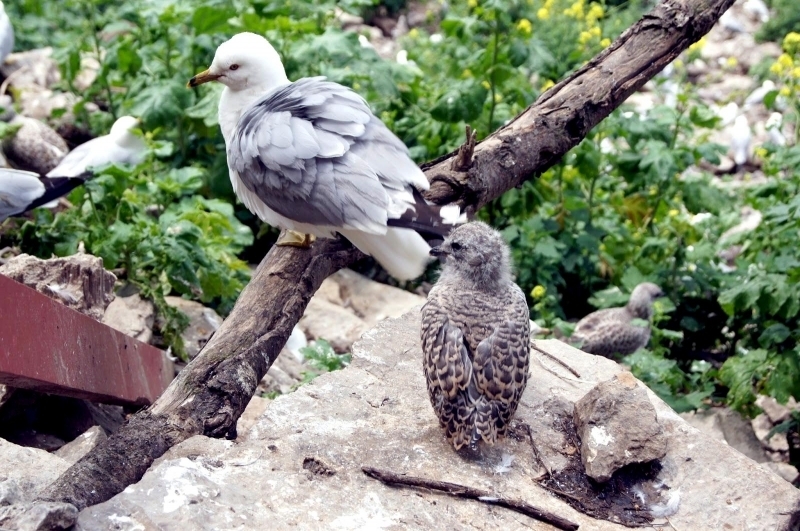 They fledge in about a month. 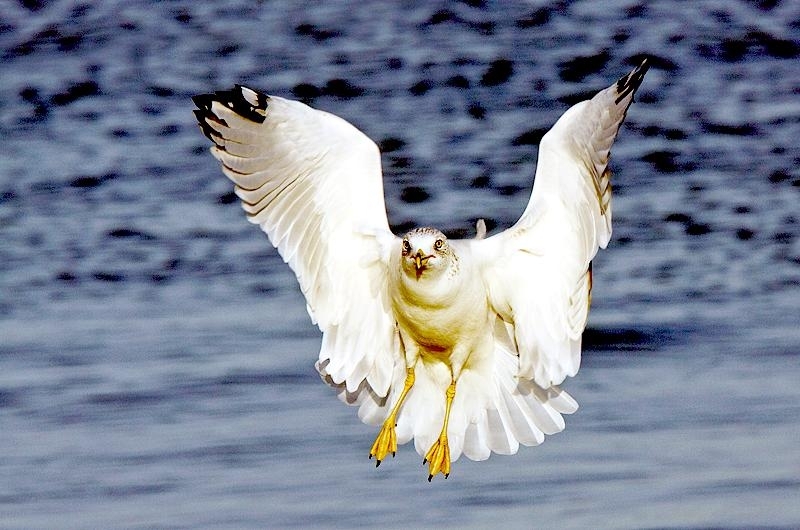 The Ring-billed Gull returns to its nesting site well before it is time to nest to establish its territory. 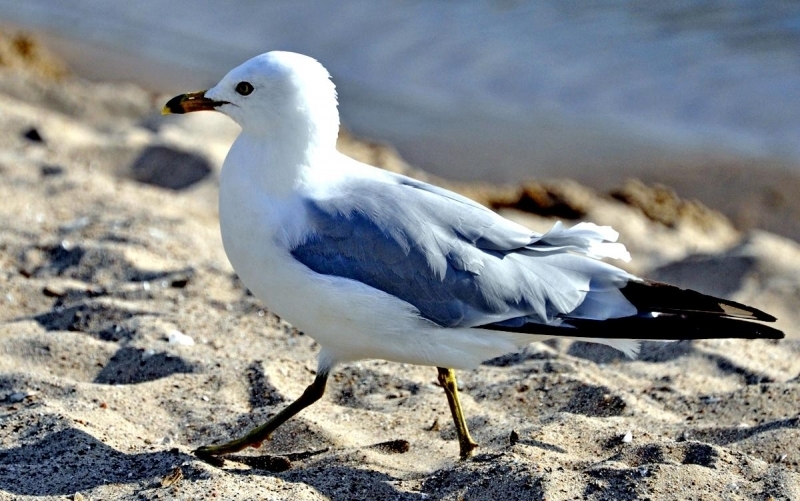 It usually nests in colonies on islands in lakes with other gulls & terns. 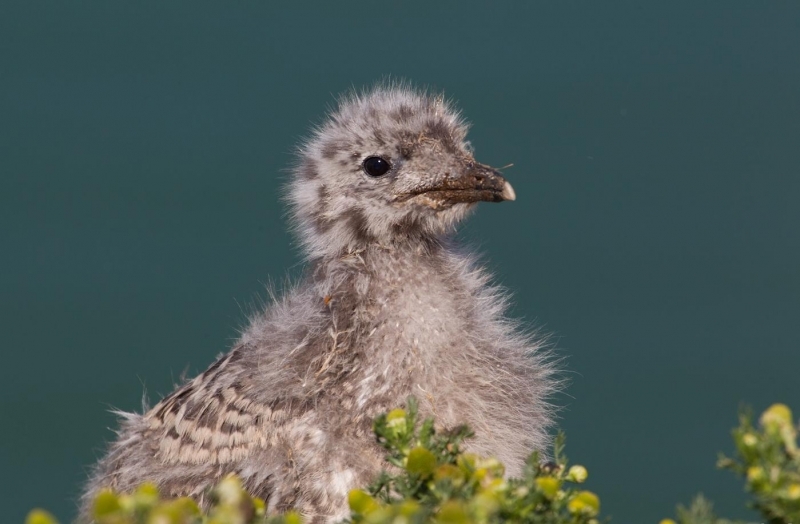 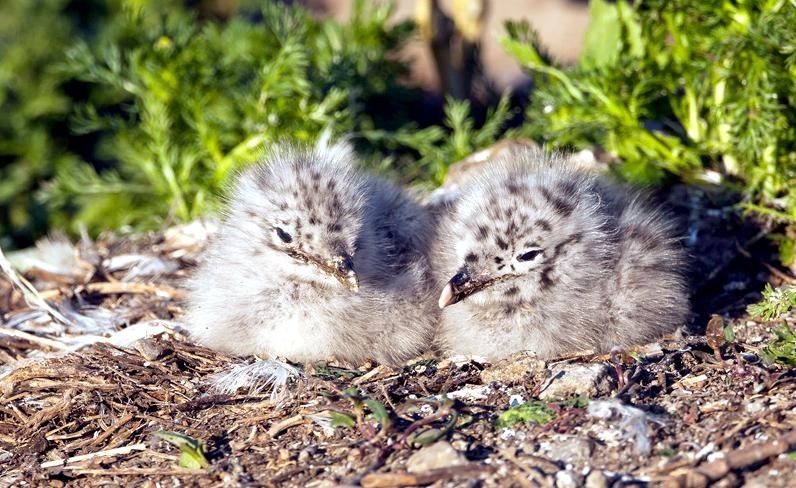 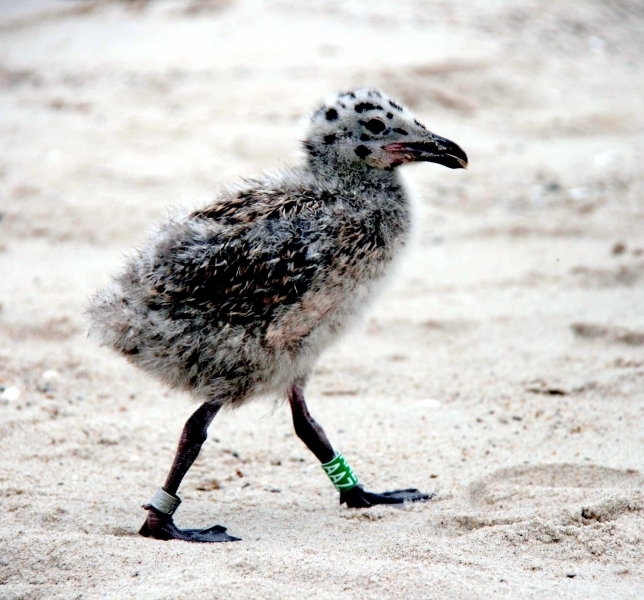 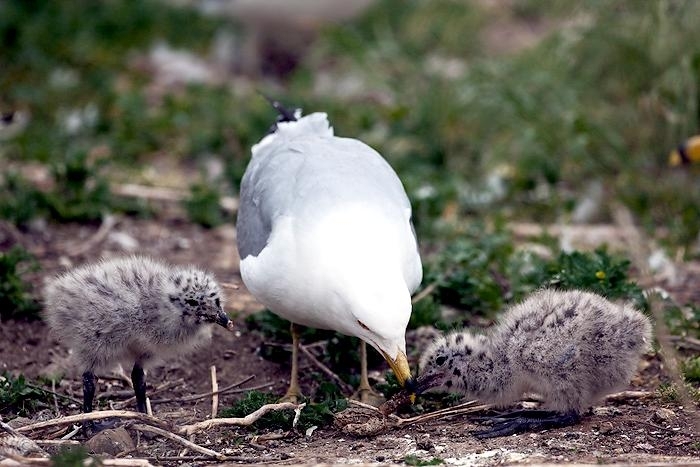 A nesting site may have as many as 1,000 pairs of Ring-billed Gulls. 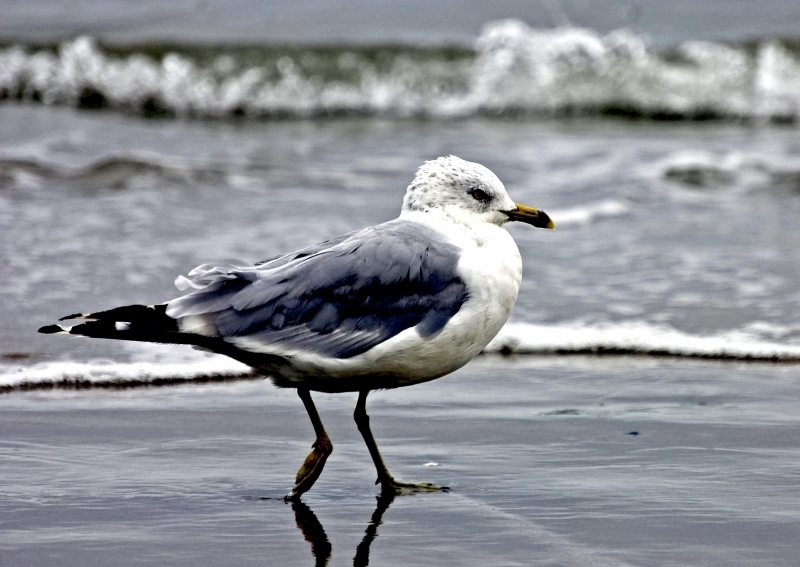 Although some live along the coast, most of these gulls go their entire lives without stepping foot in the ocean. 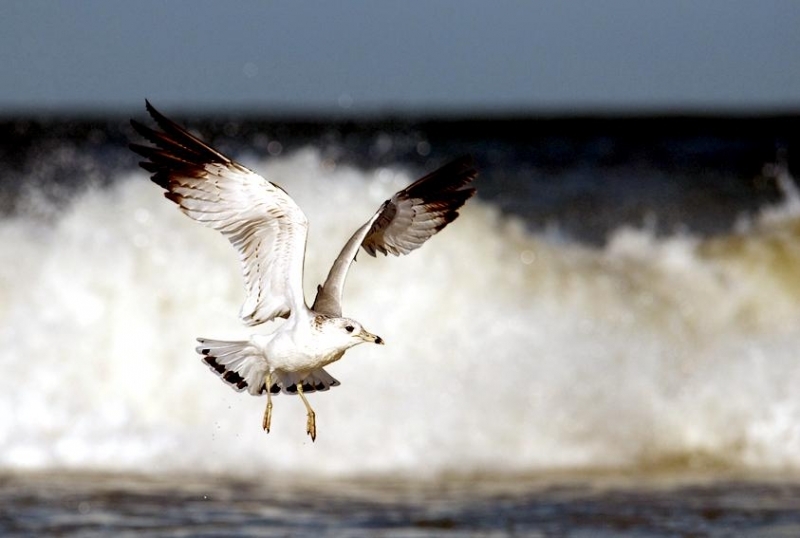 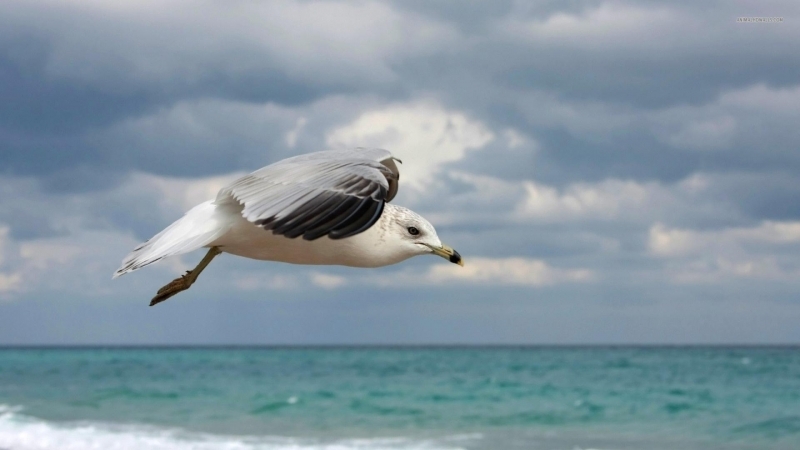 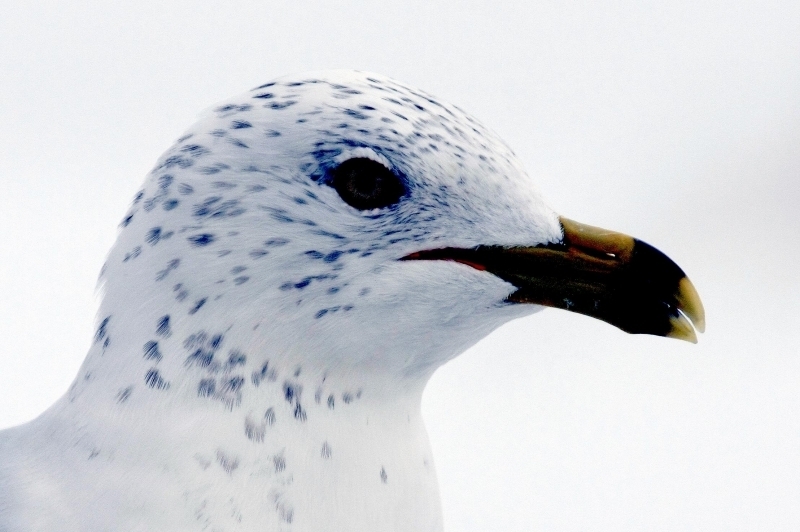 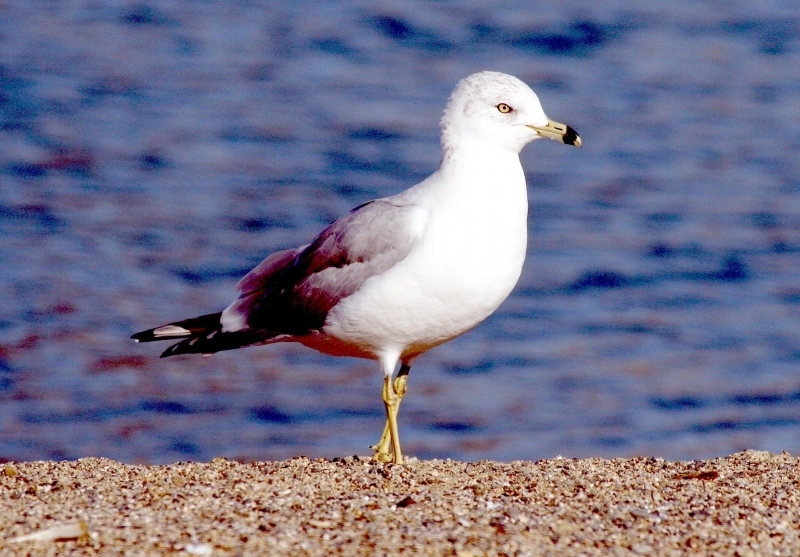 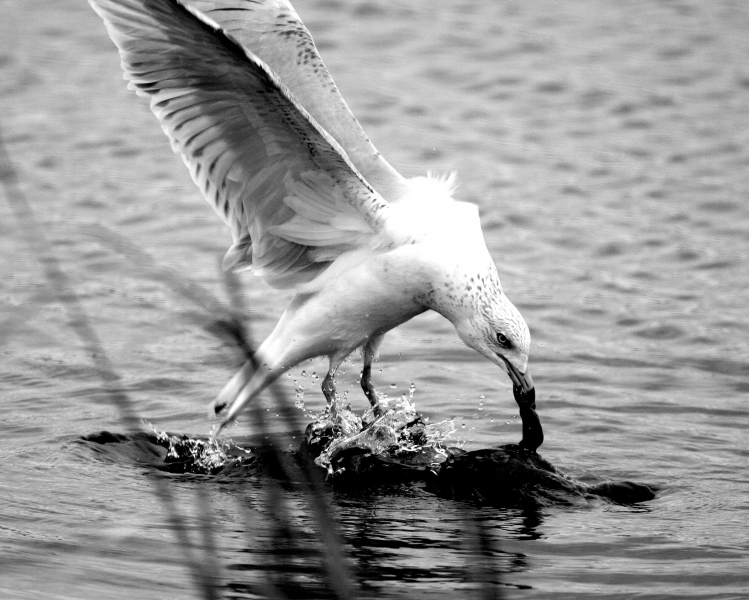 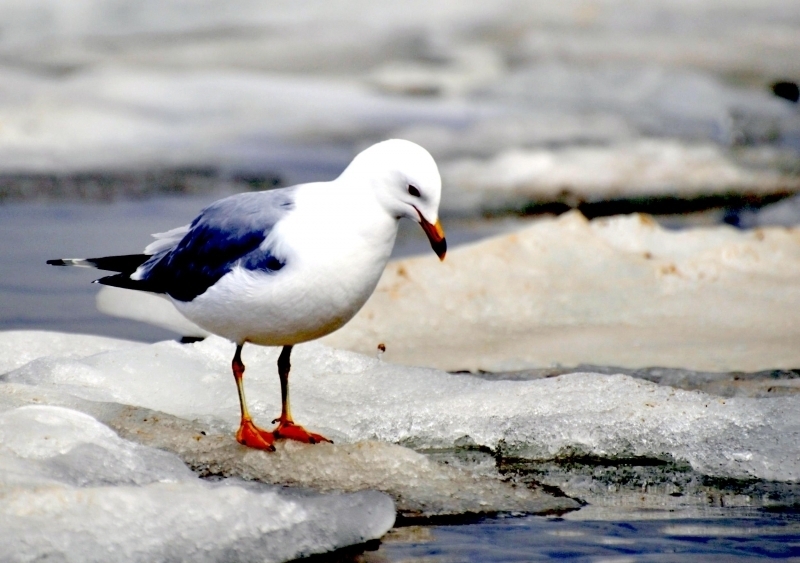 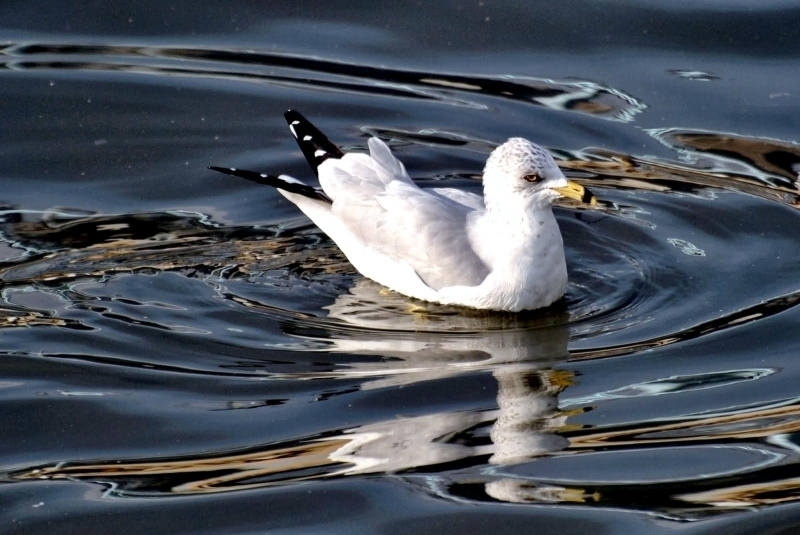 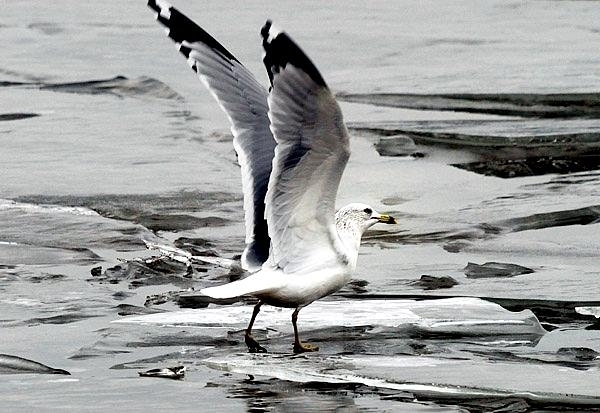 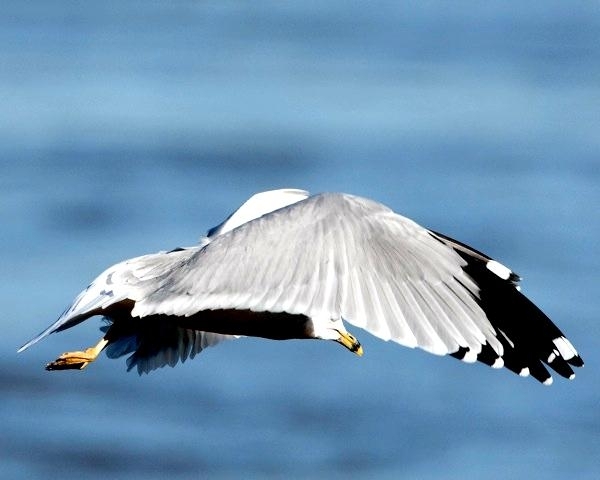 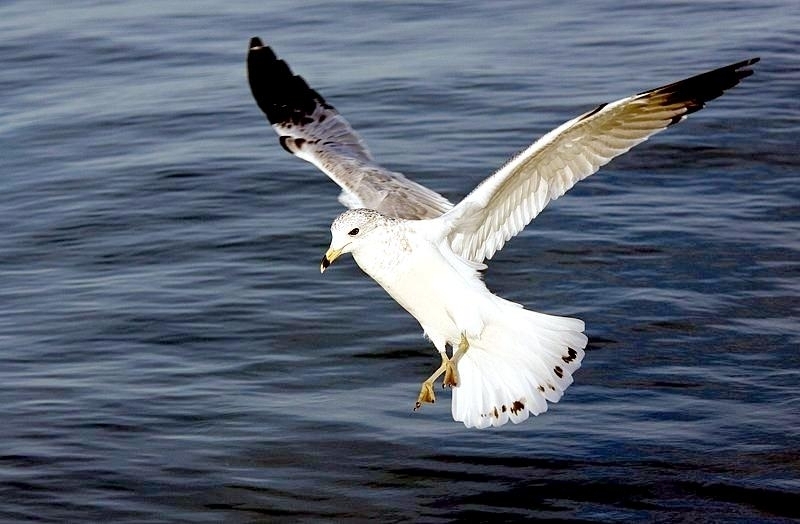 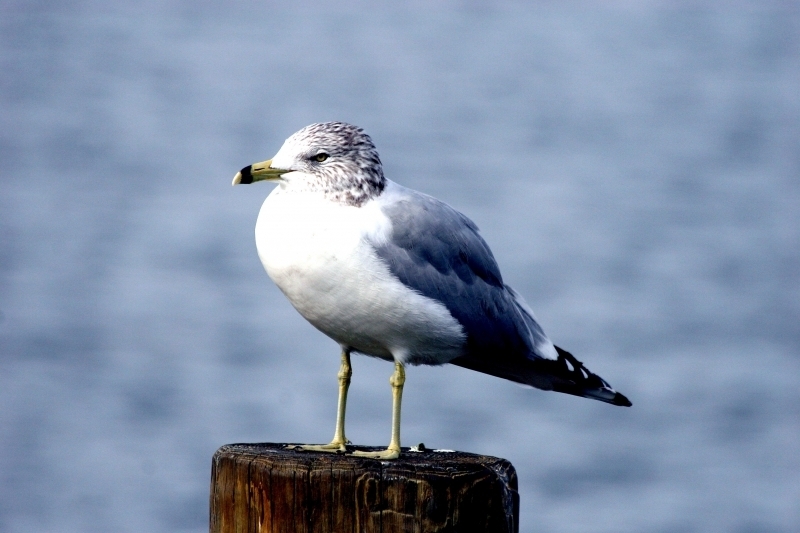 Ring-billed Gulls are found along beaches, inland waterways, lakes and wet meadows. 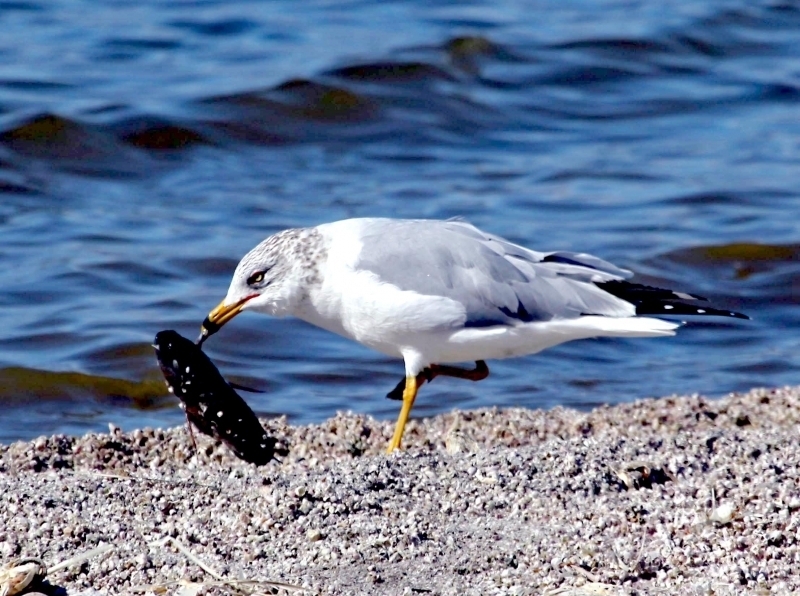 They generally like open areas with sandy or rocky ground with only sparse vegetation and pebble beaches. 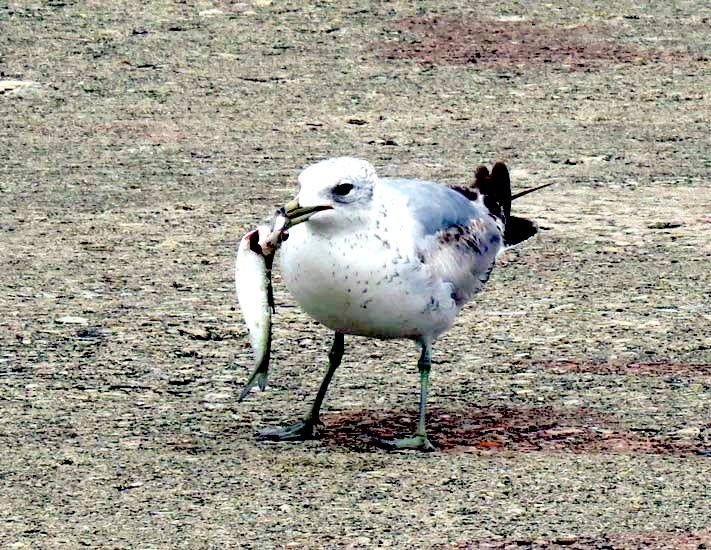 They can also be seen scavenging at landfills. 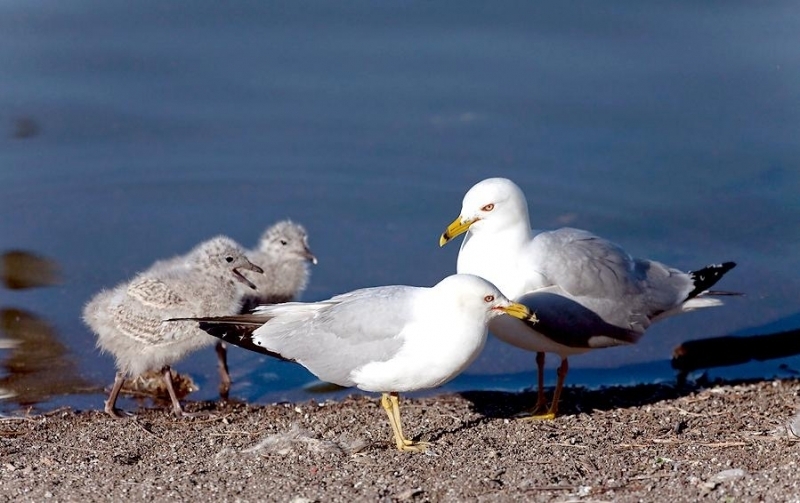 Ring-billed Gulls are highly social birds that are usually found in large colonies, even more so when breeding. 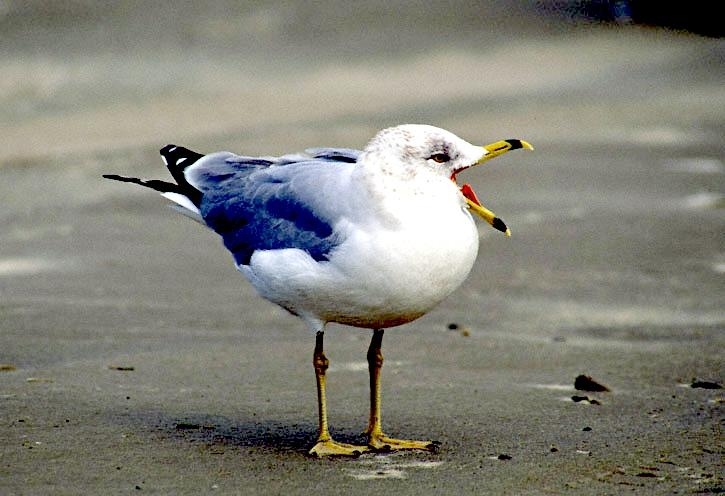 They defend small territories within nesting colonies. 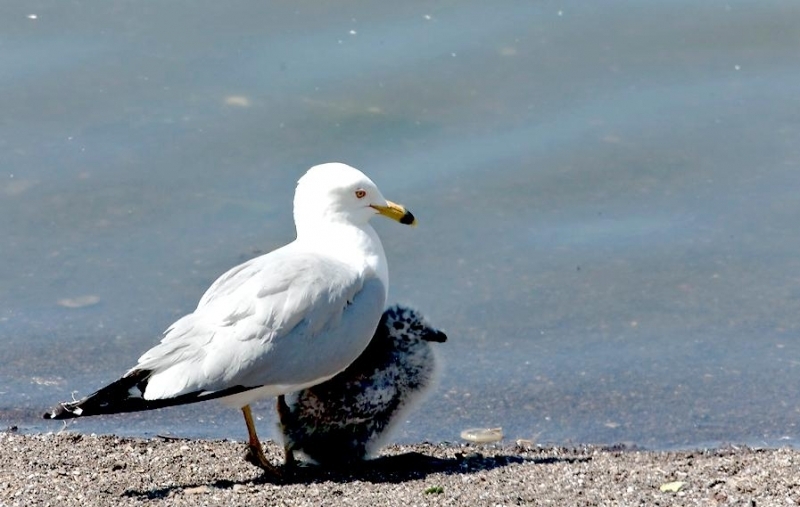 Within these nesting colonies, pairs will aggressively defend small territories around their nests. 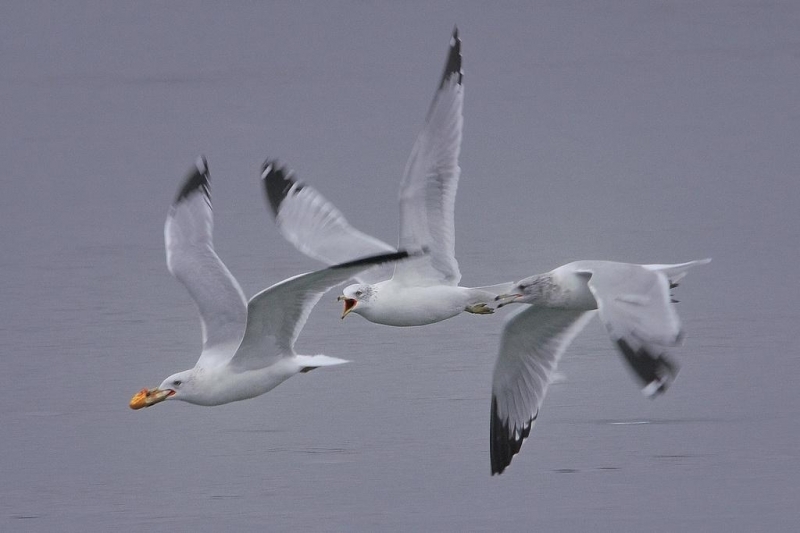 Ring-billed Gulls have been observed in play, dropping objects in flight and then dropping down to catch them.